Rolf Liebermann composed this piece for the Swiss Expo (National exhibition) 1964. Scored for 156 machines - amongst which one can find 16 typewriters, 18 calculator machines, 8 accounting machines, 12 office perforators, 10 caisses enregistreuses, 8 humidificateurs-colleurs, 8 tele-scripteurs, 2 metronomes, 4 bells of signalisation, 2 entrance door gongs, 10 claxons, 16 telephones, 40 experimental signal receptors,1 fork lift, a duplicator and a monte-charge. Rolf Liebermann was also the head of the main music section of the Norddeutscher Rundfunk (NDR) from 1957 to 1959. In this function he was responsible for instigating the famous NDR Jazzworkshops. His most popular work might be his Concerto for Jazz Band and Symphony Orchestra which was premiered by Hans Rosebaud in Donaueschingen in 1954. Another version of this EP was released on Turicaphon EX 17-102 (1964). Note: "Les Echanges" was composed by Rolf Lieberman. 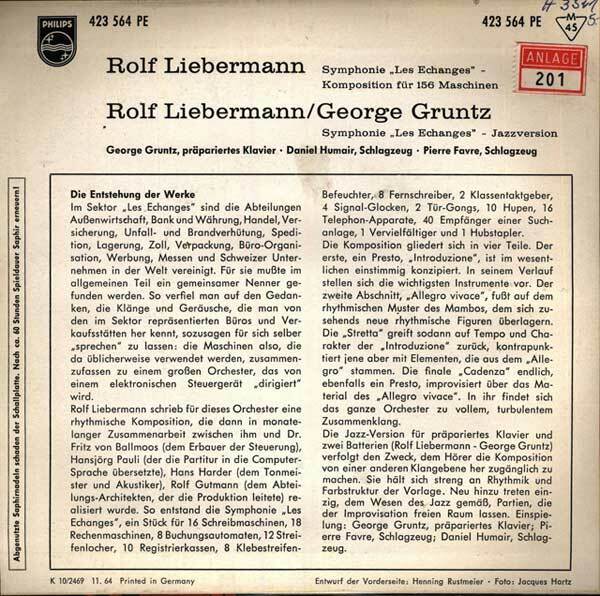 The Jazz version "Les Echanges" - Jazzversion was composed by Liebermann with George Gruntz. The Jazz version includes improvised parts.